When I read that I had just torn a few strips of the velvet, spraying velvet dust all over my braiding table and immediately agreed; sewing was a challenge too but when I saw the contrast of the velvet sheen against the wool, I was hooked. I became obsessed and dragged my fiber friends to join the hunt whenever we shopped for wool, not that I cured my addiction to wool shopping; no, just added another stash. I found there are various forms of velvet depending on the base fiber, e.g., nylon, silk, polyester, etc. The first few braided mats were using non stretch rayon which tears well, tho messily. 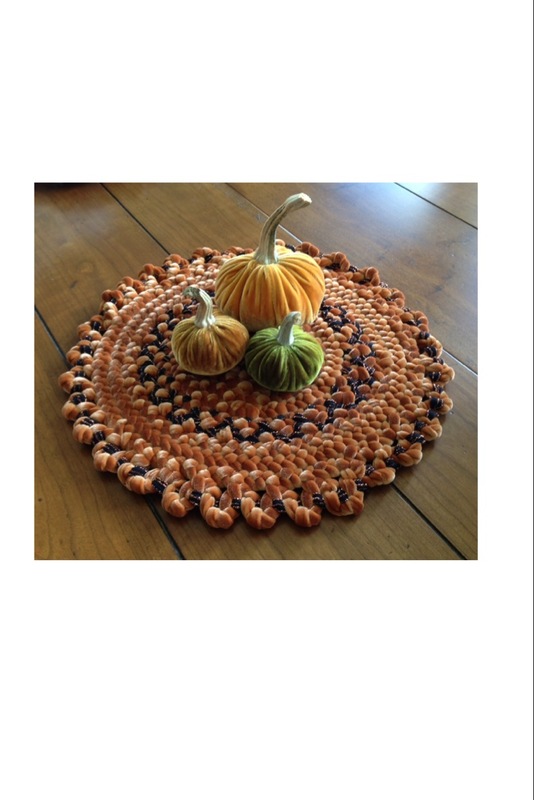 I added velvet to wool and braided exclusively one mat for the kitchen table center which had all the colors of my everyday dishes. When shopping for velvet at thrift stores I found garments are often made from stretch velvet and so I began braiding with that fabric. Not as fussy in that you can’t tear it, must cut with a rotary cutter/healing mat or with scissors, but harder but not impossible to braid with as the tension is not as uniform. But the drape of the velvet and the contrast to wool and the sheen is just as pleasant. I was given a beautiful thick orange velvet dress and when I told my gifter I was afraid it would be too small for me but that I might use it in braiding, it turned into this and several other items as I had discovered that hooking with velvet was also interesting, either with wool or by itself. I experimented with different velvets but found the only one that hooked satisfactorily was stretch velvet because it does not fray and has a nice drape because you can vary the loop height. Although some rug hookers use silk velvet I find it not as satisfactory for these reasons. Most stretch velvets are polyester. This was the Friendship mat I hooked and braided in all velvet for the TIGHR Conference. 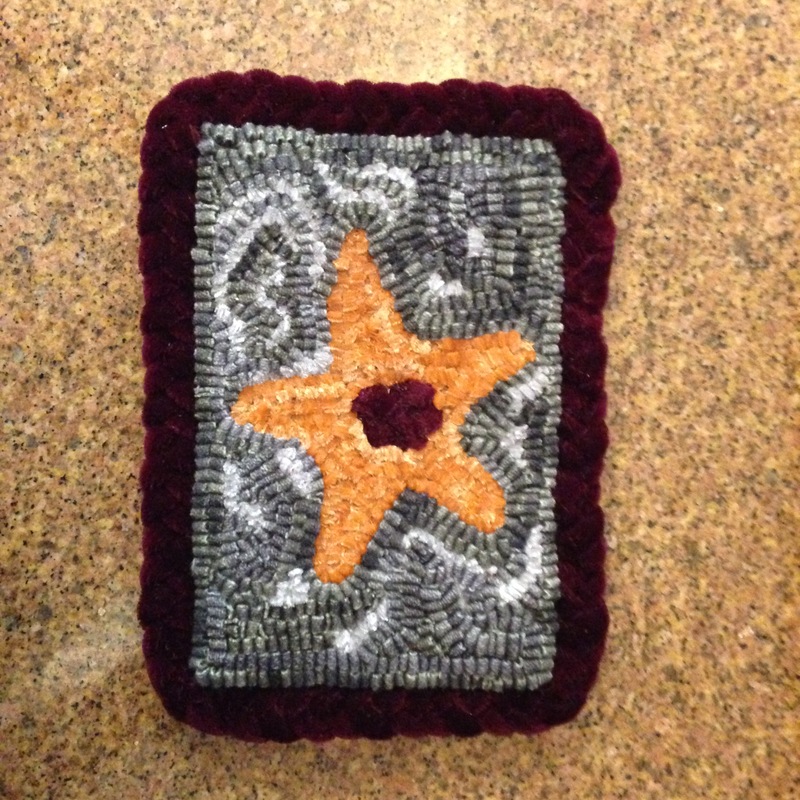 My hooking guild demonstrates rug hooking at the California State Fair and a couple of years ago I decided to use all velvet during the time I was there to contrast from the others who were using wool. That eventually yielded this hanging. I was not able to buy or find cream/beige and so had to settle for crushed white stretch velvet; I dulled it with tea but it didn’t really take the tea dye, but that intrigued me to think about dyeing stretch velvet. 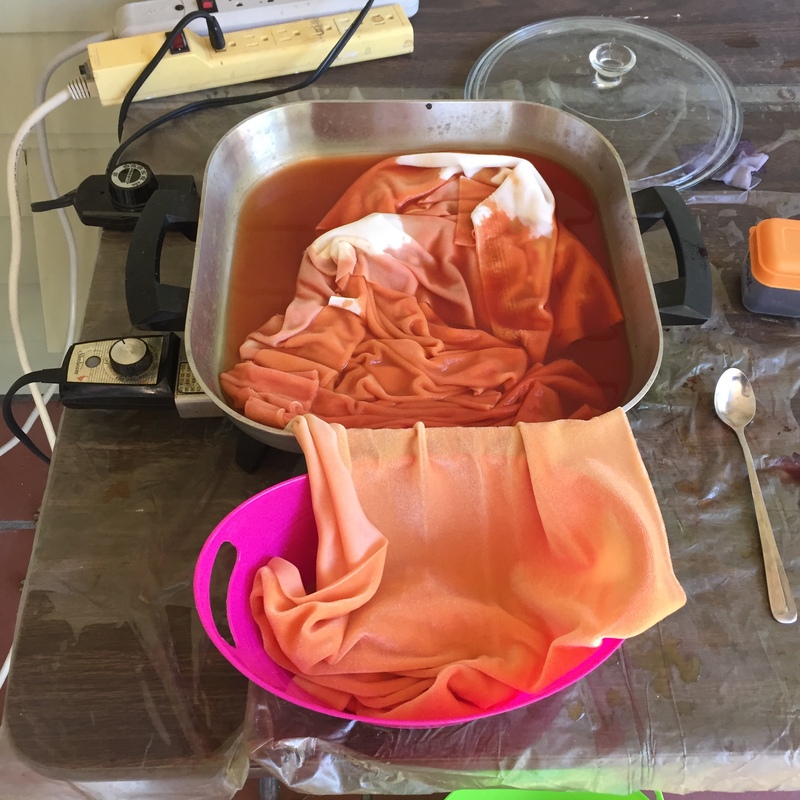 I had been experimenting with dyeing wool, thanks to my good friend Kris McDermet encouraging me to try the Primary Fusion method which uses only 4 basic colors to create 58 shades. 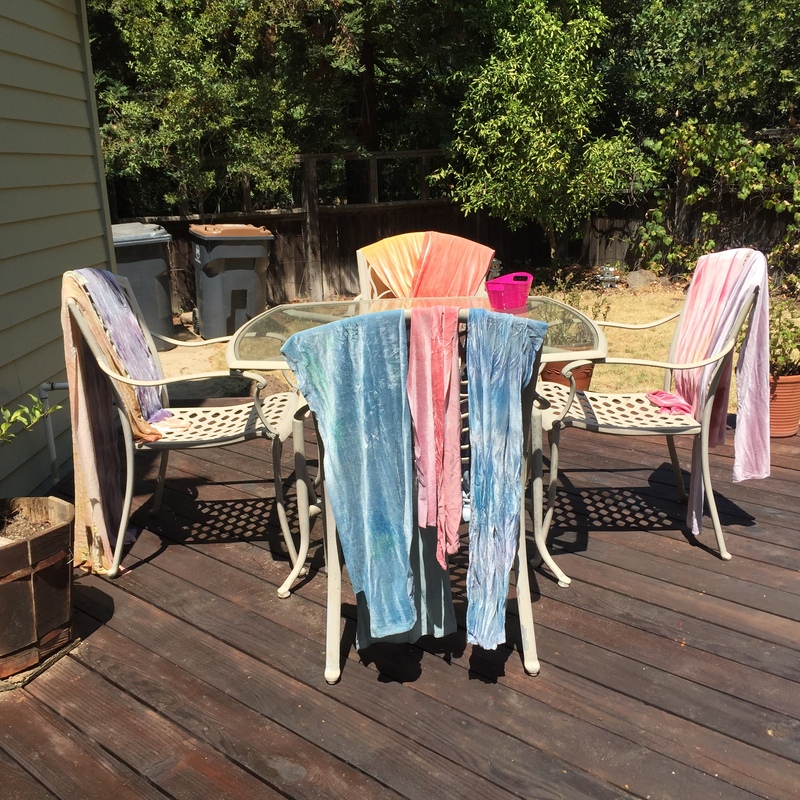 So that brings me to what I was doing yesterday afternoon in the 105 degree California weather: dyeing velvet on the back porch. Here are some pictures. 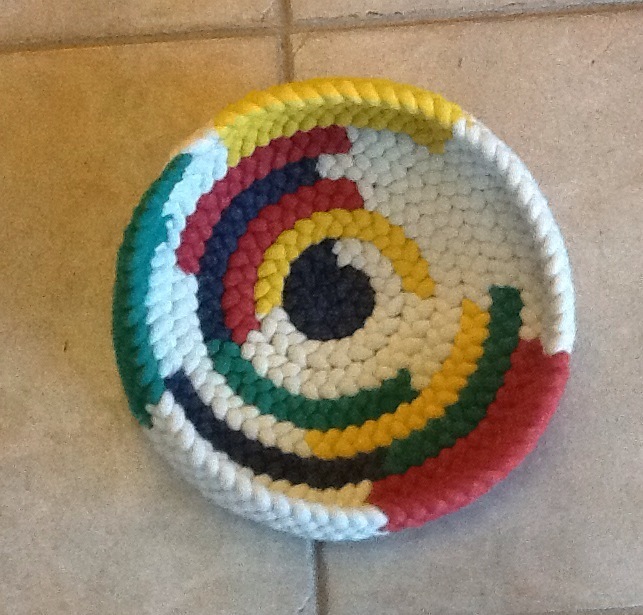 It was fun, almost addictive, trying different color combinations and techniques to yield 1/3 yd pieces which can be hooked and/or braided into bowls, mats, hangings. I can’t wait to try them out! If you are interested in exploring velvet, realizing it is ‘fussy’ but worth it, let me know and I will share some of my efforts. I have thought of reactivating my Etsy site selling the hand dyed stretch velvet under the name “Velvet Touch” but it is difficult to photograph well because of the sheen so that is still a work in progress. Stay cool! Starting the 15 strand row. Christine here. It has been subtly (and once, overtly) suggested by a couple of readers in private emails to me that perhaps I have a touch of seasonal affective disorder, due to the extremity of my despair and isolationism and irritability in the winters. Well, are they wrong: I get that way in the summers, too. My only solace right now is that we have central air conditioning. When we first moved into this house, 9 years ago, we did not have air conditioning. It was July, there was an unexpected heat wave, and we were carrying boxes of books up to the third floor, where all the heat had clustered and it was triple the temperature outdoors. I distinctly remember sitting down on a chair, trying to avoid having any piece of skin touch another in the sticky heat, and absolutely refusing to move another box until there was air conditioning. In an amazing and rare display of responsiveness to my complaints, my husband contacted the AC company and 5 days later we had central air – probably a record for workmen’s (and husband’s) activity in this household. So, despite the fact that we battle over the exact temperature to which the thermostat is set, the house is reasonably comfortable, even though it’s 90+ degrees and really, awfully, humid outside. But, wool is still very warm, even in a 73 degree house, and it is just darned hot to work with right now. I often lace on my lap (although, when I am teaching, I yell at anyone else who doesn’t lace on a table). In the summers, I can’t lace on my lap at all: the hot wool rug on my legs is stifling. Many of us take breaks from braiding and guild meetings in the summers for this very reason… and of course, because a lot of people are away on vacation. My guild doesn’t meet again until mid-September, and I am missing talking with other braiders and friends terribly. But, with some alterations in technique, I am still braiding. I have that book to write, after all. I am up to 15 strands on my circular multistrand. Norma Sturges helpfully told me the source of the pattern for this sort of circular multistrand rug: a 1949 Better Homes and Gardens magazine. There is one entire page of instructions for how to braid a rug, and few sidebar comments about making a “whirring wheel” variation. (I always find it fascinating what skilled seamstresses our female forebears were, that they could intuit all of the steps of braiding a rug from reading just a few paragraphs at most). Working with wool makes our “warp” strands large enough that the wool “weft” can’t be packed over top of them, so we see a strand’s path as a zigzag rather than a single direction. I am hypothesizing that the whirring wheel in the photo used cotton fabrics, which could be packed firmly to give the unidirectional “whirring” effect. Photo from magazine above, p. 195. 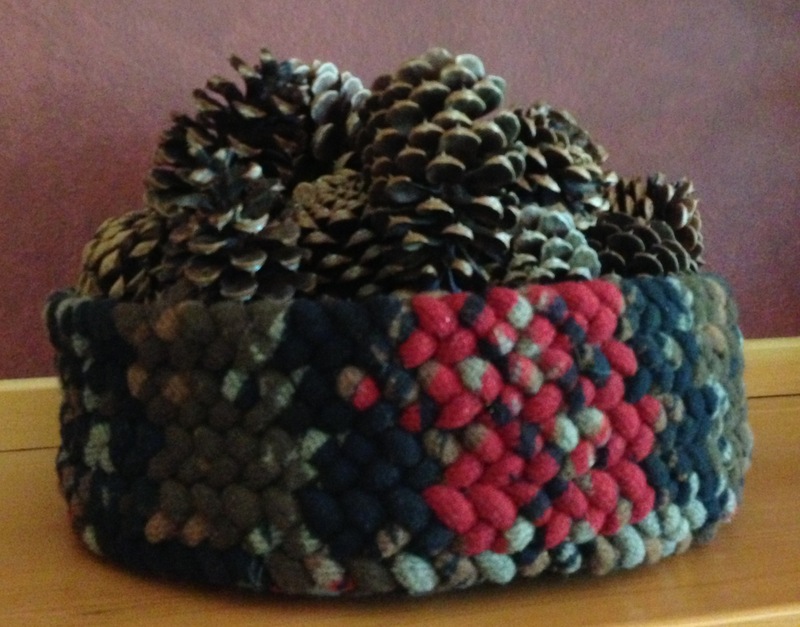 Norma found one of these rugs and has a photo of it in the front of her book, The Braided Rug book. Thanks to Norma for letting me know about the magazine article – I love collecting old references to braid instructions and patterns. I am altering the directions from the magazine slightly; I wanted to go higher than 13 strands at once so that I could get experience working with higher-numbered braids and be able to write about their attendant difficulties. I’m on a row with 15 strands at the moment, and I’m planning on getting up to 17 before I start tapering. I know that Maxine Ward has worked with up to 23 strands at once… I think I might have to let her record stand. Yesterday, my friend Wanda and I went to the Fiber Art International 2016 exhibit (http://fiberartinternational.org). 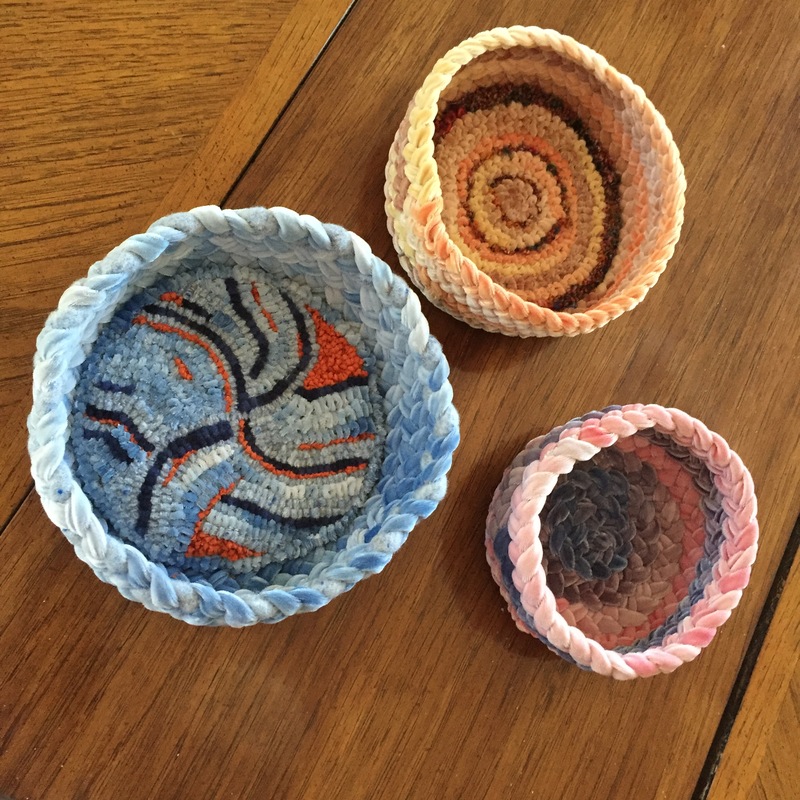 It’s an exhibit of fiber art held first at two locations in Pittsburgh, and then it will travel around to other places in the future. One of the initial comments about the exhibit explained that the pieces selected had to display either art made with fibers, or art made using the traditional techniques for fibers (weaving, embroidery, etc). It’s always… interesting… to go to an exhibit and see what is included in the category of art. I have to admit that some of the pieces caused me to stop and just stand there, blinking at them in mystification. There was an art “installation” that was three objects arranged as if they had just been left there during the set-up process for the exhibit… is that art? There was a large piece of woven black electrical cords with various ends sticking out. It was visually striking, and I kind of liked looking at it, but it is art? What about the machine gun made from pink plastic tampons stuck together, from which emerged red yarn dripping into a puddle? I have to admit that I sort of scampered past that one. Whether it’s art or not, I didn’t particularly want to look at it. Another comment in some of the opening literature was something to the effect that “art” should provoke you, or represent a theme, or convey a concept – I forget the exact wording. Some of the concepts were clearly beyond me. But, at least half of the pieces were tremendously skilled and I enjoyed looking at them. I included just a few of the ones that I liked. “Butting Head Ram” 2014, by Gwen Samuels: digital images on transparency, wire armature, Los Angeles, CA. Here’s one I liked a lot: “Erosion.” Wanda is there off to the left looking at another display, but it gives you an idea of how very large this piece is so I left her in the photo. I definitely think the exhibit is worth going to see, if it travels near you over the next year. Of course, in my opinion, any fiber art exhibit that doesn’t include some braiding is CLEARLY in need of education. But, I really don’t see myself braiding with electrical cords or alluding to menstruation in my braided rugs, so maybe I’m just not an ARTIST. I have to admit, I came away from this exhibit thinking that maybe “fine craft” is a happier category for those of us who like to braid: I’d rather make a beautiful rug than convey any sort of thought-provoking concept or braid with “unique” materials. Ultimately, I want my braids to be used rather than hung on a wall, so if that just makes me a craftsman rather than an artist, then I’m happy with that. I do think that braids can be used to create art – I still think that Pam Rowan’s basket, into which she braided stones wrapped in wire, would “qualify” as art, for example, and Kris McDermet’s unique hooked and braided creations certainly would also… so, there are some “artists” among those of us who like to braid. But isn’t being a craftsman a good thing? I’m sure my work won’t ever go on tour with the next FiberArt International exhibit, but… I’m not sure I’d even really want it to. I like what I make and I use what I make, and the usefulness of my work is part of its pleasure for me. Guess I’m a craftsman. Christine here. At the end of last week, we spent two hot, sunny days with our son touring colleges in Central PA. We put the dogs in the kennel and stayed overnight at my folks’ place. We toured Gettysburg and Dickinson Colleges, asked questions in the areas of Jack’s subject interests, and tried to help him with the college decision. When we got back, we tried to have a family dinner. Jack’s eye-rolling comment: “Haven’t I spent ENOUGH time with you two lately?” The dinner was spent trying to involve Jack in pleasant conversation, while Jack kept a bored and disgusted expression firmly on his face and imitated a bear. When he became just too awful we finally kicked him out of dinner and sent him (happily) off to his room. The funny thing is, I don’t even remember saying that, although I’m sure it happened. I had a best friend who was from Boston, so she knew about cheap student housing that was rented out by the week over the summer. I shared a suite with her and, of all things, her mother, who was in the middle of getting a divorce. In the fall, she went back to school, her mother got her own place, and I moved into an apartment with two other women. So… perhaps my son is taking after teenaged me. Although I wince to remember it now, at 18, I found my parents annoying, tiresome, boring, stupid, and so backward and religious that they had no connection with the current world. I found their attempts to guide me to be stupid and irrelevant. I was an adult, it was my life, I knew what I was doing and I certainly knew more about what I should do than my parents. In a feeble defense of my own awfulness to my parents, I really did profit from my time away from college. I think I matured pretty late in comparison to peers… and I wasn’t particularly socially savvy, either. So taking an extra year away from school was great for me: I remember learning navigate the subway system with tremendous pride and enjoyment (I was from Wagontown, PA: no subway there). I even liked learning to cook, becoming vegetarian, working at the Cambridge Food Co-op, doing my laundry, and getting a couple part-time jobs. I found a quilt pattern, “Night and Noon” in a book at the library, and bought cotton scraps to start a hand-sewn quilt (I finished it several years later by machine). I reveled in being in control of my own life, and determining each day what I wanted to do without parental interference. After awhile I realized that I missed college and I did return to school. Many thanks to a dean who changed my “dropping out” to “leave of absence,” which enabled me to retain my scholarship so that I could go back. So… I am holding my own teenage awfulness firmly in mind and trying not to become really angry with Jack’s attitude toward me and my husband. I am trying to realize that he’s just engaging in that necessary step of asserting control over one’s own destiny, which means – at least to some kids – being an Obnoxious Toad to one’s parents. It’s not very much fun for me…. but at least my mother is enjoying it. My multistrand swirl rug in progress. 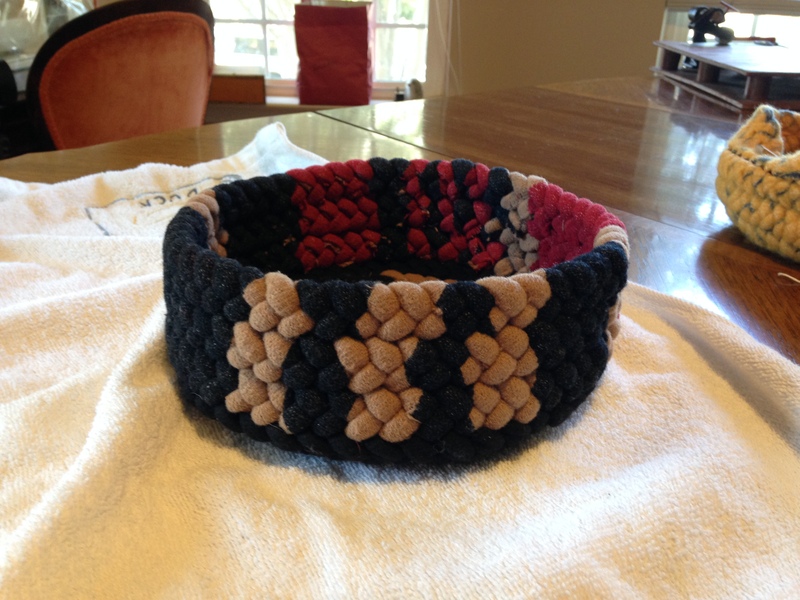 I’m finally trying to finish one of the multistrand projects that will be in the book I’m working on. 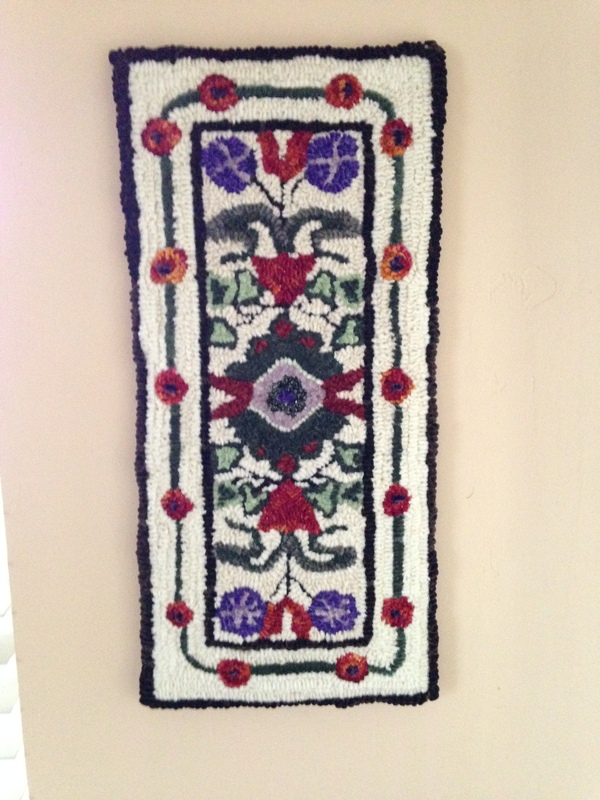 I taught a class a few years ago at the Valley Forge braid in on how to make this rug, and despite being rather relentless in encouraging the students to finish their versions… I never finished mine. (I know, I’m terrible). But, I’m finally getting back to it. Pam Rowan’s version is in the previous post. Here’s a photo of Norma Sturges’ rug that inspired me to teach the class. Critiquing my own rug by comparison, I think I should have started my dark strands earlier to get the appearance of flower petals… but, I’m planning on making my rug big, so I hope that I can still get the flower-petal look with more rows. And here’s the rug by Nancy Young that I also alluded to in the last post as an inspiration (shown here announcing our braided rug exhibit at the Schwenkfelder Museum). Here, the flower petal look is created with both white (outlined by an adjacent black) and red strands. Dianne has been kindly looking over my early book chapters in Dropbox. It’s reminding me pleasantly of when we worked together before on the Combining Rug Hooking and Braiding book, but without the associated stress. Of course, I’m really not that far along in the book, so it’s pretty relaxed at present. But, I am hoping to have most of the multistrand book fleshed out by December 31… we’ll see.